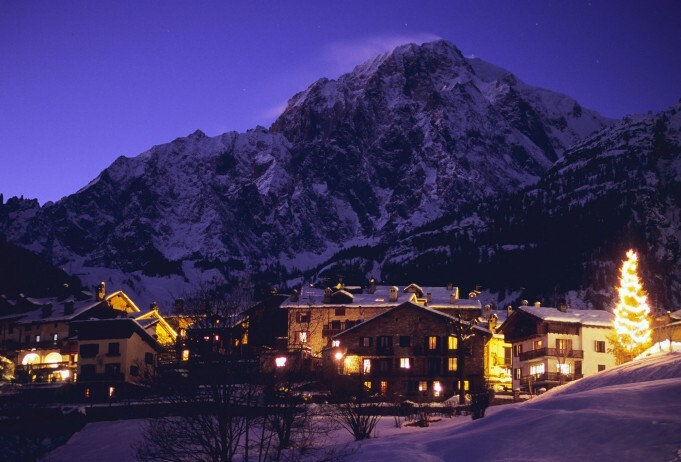 If shopping, exceptional Italian dining and skiing all rolled into one sound like a dream vacation, then Courmayeur should be your next ski trip. This picturesque Alpine village is situated in Italy’s Valle d’Aosta region and lies at the foot of Mont Blanc, Europe’s highest mountain. Courmayeur is close to both the French and Swiss borders. The village exudes coziness with a warren of narrow cobblestone streets, small bars and fabulous restaurants. Courmayeur skiing, which is comprised of 62 miles of terrain, can be found just above the town, which is connected by two cable cars and a gondola that stretches across the valley; it’s a short return to town by bus. With views of Mont Blanc from just about every direction, the scenery can’t be beat. Partiers will be pleased with Courmayeur’s collection of lively discos. There are plenty of other off-mountain activities on a Courmayeur ski vacation, including an open-air ice skating rink and quintessential Italian boutique shopping on Via Rome. But its star quality is found in the restaurants, where the Italians seem to spend far more time than on the slopes. At Courmayeur-Mont Blanc there are slopes for absolutely every level of skier, from beginner to expert. Experts looking for a challenge will likely prefer Courmayeur’s off-piste offerings. However Val Veny’s moguled black runs will surely get anyone’s blood pumping. Courmayeur’s best off-piste routes are found off the top of the resort’s chairlift network and can be explored in a clockwise loop from Arp Vieille to Val Veny, or skiers can head east from the summit to Dolonne or Pre-St. Didier, or south to the Youla gorge. An experienced backcountry guide is highly recommended for optimal safety and enjoyment. Intermediates will find plenty of wide-open red and blue runs to keep them occupied, especially in the Col Checrouit area. First-time skiers have a magic carpet and learning zone at the top of the Entreves tram. Cable cars, gondolas, chair lifts and poma lifts offer remarkable efficient connections to every part of the mountain. The closest airport for ease of access to Courmayeur is Annecy just over the French border at 73 miles away. A 6 seat Cessna Citation CJ2 jet from London to Annecy is approximately 1 hour 20 minutes. A larger 8 seat Cessna Citation XLS will complete the journey in 1 hour 15 minutes. The Drive time will take approximately 1 hour 40 minutes. A helicopter will get you there in 45 minutes. Arranging a private jet charter or helicopter transfer with Freedom Air to arrive in style to Courmayeur is simple. The Freedom Air team can be reached on +44 (0) 1275 548001 to book your next trip.